Special Deal � 3"x3" Photo Prints on Bamboo Magnet - Only $9.95 at PhotoCanvasLand.com. Super Deal - Photo Metallic Luster Prints Mounted on Foamcore Board 8x10 - Only $5.49 at PhotoCanvasLand.com. Special Deal - Premium Dust Cover For Any Canvas - Only $4.99 At Photocanvasland.com. ON SALE! Photo Canvas Land offers museum high quality photo canvas at great sale price - Gallery wrap (1.5") 8"x8" your favorite photo on canvas at only $17.95 from Photocanvasland.com. ON SALE! Photo Canvas Land offers museum high quality photo canvas at great sale price - Rolled 8"x8" your favorite photo on canvas at only $7.95 from PhotoCanvasLand.com. ON SALE! Photo Canvas Land offers museum high quality photo canvas at great sale price - Standard wrap (0.75") 8"x8" your favorite photo on canvas at only $14.95 from PhotoCanvasLand.com. Save 5$ Off For Any Canvas Over $75! Save 5$ Off For Any Canvas Order Over $75 at PhotoCanvasLand.com. With coupon code: HAPPY5 at checkout. Save 15$ Off For Any Canvas Over $150! Save 15$ Off For Any Canvas Order Over $150 at PhotoCanvasLand.com. Use coupon code: HAPPY15 at checkout. Save 25$ Off For Any Canvas Order Over $200 at PhotoCanvasLand.com. Use coupon code: HAPPY25 at checkout. Save $5 Off For Any Photo Prints Mounted on Foamcore Board Order Over $75 at PhotoCanvasLand.com. Use coupon code: HAPPY5 at checkout. Save $15 Off For Any Photo Prints Mounted on Foamcore Board Order Over $150 at PhotoCanvasLand.com. Use coupon code: HAPPY15 at checkout. Save $25 off for any Photo Prints Mounted on Foamcore Board order over $200 at PhotoCanvasLand.com. Make the perfect gift for any occasions � birthday, wedding anniversary, Mother�s Day, travel and vacation. Photo Canvas from Photo Canvas Land is certainly the most beautiful, personalized yet inexpensive gifts you can choose for your family and your loved ones. Special Sale � Photo Prints Mounted on Foamcore Board 8x10 - Now Only $3.99 at PhotoCanvasLand.com. Photo prints and canvas from Photo Canvas Land is certainly the most beautiful, personalized yet inexpensive gifts you can choose for your family and your loved ones. 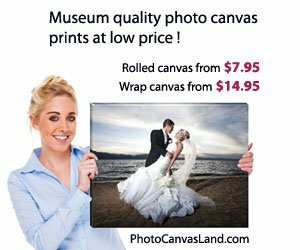 Photo Canvas Land offers museum high quality prints and canvas at low price. Super Sale - Photo Luster Prints Mounted on Foamcore Board 8x10 - Only $3.99 at PhotoCanvasLand.com. Photo prints and canvas from Photo Canvas Land is certainly the most beautiful, personalized yet inexpensive gifts you can choose for your family and your loved ones. Photo Canvas Land offers museum high quality prints and canvas at low price. Super Sale - Photo Metallic Glossy Prints Mounted on Foamcore Board 8x10 - Only $4.49 at PhotoCanvasLand.com. Photo prints and canvas from Photo Canvas Land is certainly the most beautiful, personalized yet inexpensive gifts you can choose for your family and your loved ones. Photo Canvas Land offers museum high quality prints and canvas at low price. Super Sale - Photo Metallic Glossy Prints Mounted on Foamcore Board 11x14 - Now Only $7.99 at PhotoCanvasLand.com. Photo prints and canvas from Photo Canvas Land is certainly the most beautiful, personalized yet inexpensive gifts you can choose for your family and your loved ones. Photo Canvas Land offers museum high quality prints and canvas at low price. Super Sale - Photo Metallic Luster Prints Mounted on Foamcore Board 11x14 - Only $7.99 at PhotoCanvasLand.com. Photo prints and canvas from Photo Canvas Land is certainly the most beautiful, personalized yet inexpensive gifts you can choose for your family and your loved ones. Photo Canvas Land offers museum high quality prints and canvas at low price. Super Sale - Photo Metallic Luster Prints Mounted on Foamcore Board 8x10 Now Only $4.49 at PhotoCanvasLand.com. Photo prints and canvas from Photo Canvas Land is certainly the most beautiful, personalized yet inexpensive gifts you can choose for your family and your loved ones. Photo Canvas Land offers museum high quality prints and canvas at low price. Our mission is to bring high quality photo canvas to mainstream consumers. Through the creative use of emerging technologies, Photo Canvas Land is devoted to innovative photo canvas process and product that help people complete tasks more easily, efficiently and with better results. The company specializes in designing and developing photo and canvas products.